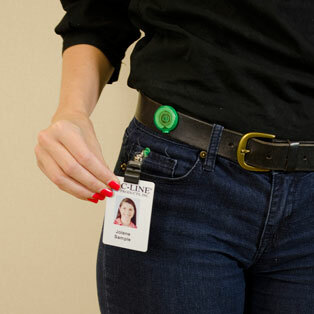 C-Line Products produces a full line of name badge accessories such as neck lanyards, chains, badge reels, badge holder adapters, and rigid ID badge holders. A variety of styles, sizes and colors make it easy to find a badge accessory to fit every need. Eliminate the need for card punching. Keep proximity and access cards or ID badges handy at all times to show and scan with ease. Breakaway lanyards break apart if pulled, snagged or caught offering added safety. Make "swiping" IDs quick and easy. Retractable Adjustable Neck Lanyard gives you flexibility with your ID. Beaded ID Neck Chains provide versatility for wearing your badge or ID. Badge Holder Adaptor attaches to any pre-punched badge holder.